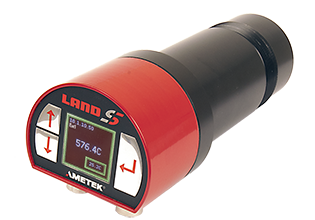 A highly accurate and stable digital pyrometer, the SPOT AL EQS uses AMETEK Land’s cutting-edge SPOT technology, and unique, advanced data-processing algorithms, to measure aluminium temperature at an extruder press exit , quench or strip mill. One pyrometer offers all three measurement modes, with dedicated pre-set algorithms which provide the most accurate digital temperature readings of low and variable emissivity aluminium. This ensures optimised press speed and high-quality products with minimal scrap. Offering measurements ranging from 200 °C (392 °F) to 700 °C (1292 °F), the pyrometer integrates with control systems to optimise throughput at the press or mill. Data is made immediately available via a rear display or via a web server. Video camera within the pyrometer and remote access to all features enables the user to view, configure, focus the pyrometer locally or remotely. Combining Ethernet, Modbus TCP, video, analogue and alarm outputs in a single device, the SPOT AL EQS is designed specifically for measuring the temperature of aluminium in extrusion, quenching or strip mills. SPOT AL EQS has three dedicated algorithms for extrusion press exit, quench exit and strip. Developed from extensive trials in real plant environments. Fully focusable high quality optics and a high speed 15ms response provide combine to provide measurements on detailed extruded profiles. SPOT AL EQS can be easily integrated directly with press controls, PLCs and control software, enabling reliable press operation and the production of high-quality products with minimal scrap. SPOTViewer PC software gives small AL EQS installations the added benefits of remote monitoring and algorithm tuning; larger installations can use SPOTServer, which allows configure, display and log data from up to 40 pyrometers, as well as full algorithm customisation for a new added product. The SPOT Actuator provides remotely controlled target alignment of a SPOT pyrometer for industrial processing applications, specifically for aluminium applications using the SPOT AL EQS pyrometer. The SPOT AL EQS is AMETEK Land’s specialist solution for non-contact temperature measurements in aluminium extrusion and rolling mills.